Sort that out or he's gone. Natsume has revealed that the the long-awaited second Wii entry in the Rune Factory series, Rune Factory: Tides of Destiny, will see the light of day in North America on 27th September. The Rune Factory spin-off from the popular Harvest Moon series combines farming elements with more traditional role-playing features, with real-time combat and an epic storyline the most notable changes to the standard hoe-and-sow formula. We're looking forward to getting our hands dirty with Rune Factory: Tides of Destiny when it's launched on 27th September. Readers in Europe, don't expect to see this until 2012 at the earliest. Burlingame, CA.- August 24, 2011 - Natsume Inc., a worldwide developer and publisher of family-oriented video games, today released new screenshots for Rune Factory: Tides of Destiny which is set to launch September 27th on both the PlayStation®3 and Nintendo Wii. 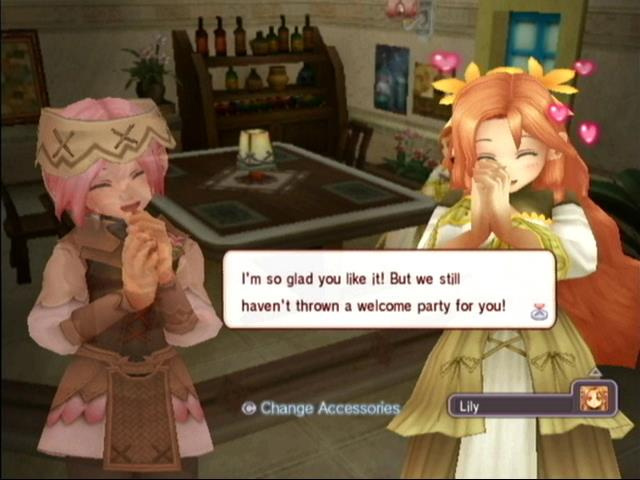 It is the first time that the Rune Factory franchise will be available on the PlayStation®3. Fans of the Harvest Moon series will enjoy the addictive and rewarding gameplay that Rune Factory: Tides of Destiny provides, while combining action-RPG game elements that together deliver a nice balance and blend of both games' universes. "We hope the new screenshots released today can 'tide' fans over until Rune Factory: Tides of Destiny launches," said Hiro Maekawa, President and CEO of Natsume. "The sprawling ocean setting will have players adventuring for hours, and the great characters will really help pull them into the world of Fenith Island. Packed with action, adventure, and romance, Rune Factory: Tides of Destiny has something for everyone!" Aden and Sonja, two lifelong friends, live a tranquil life on Fenith Island until they're struck by a mysterious curse: they awaken to find both of their souls are now trapped in the same body! On top of this unusual calamity, the Fenith Island they knew is gone, replaced by a strange island populated with unfamiliar faces. Only by exploring this new world will they be able to solve the mystery of this curse and save their beloved island. During the course of their journey, Aden and Sonja will be aided by a colorful cast of characters, as well as take command of a towering golem, Ymir. Using their newfound giant friend, they'll cross vast seas, discover hidden islands and dungeons packed with riches, and battle fearsome monsters of the deep! 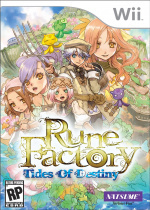 For more information on Rune Factory: Tides of Destiny for PlayStation 3 and Nintendo Wii, please visit www.natsume.com. You can also follow all of the latest Natsume news at www.natsume.com/facebook, www.twitter.com/natsume_inc., and see the latest game footage at http://www.youtube.com/user/NatsumeUSA. YES! i loved Frontier, i just may have to sell animal parade to get this one. I just hope they dropped the Runey system from Frontier, or at least gave it a major overhaul. If not for being forced to nearly constantly babysit those little buggers, R.F. Frontier would be my favorite Wii game. I was about to say the exacty same thing Number_6. I enjoyed rune factory frontier up until the point I realised sucess in the game wasn't about the farming or about the rpging. It was about balancing those horrible beasts called runeys and was no fun at all. Yeah, it wasn't until I accidentally created a "grass factory" that I was able to keeps the runeys in check without spending massive amounts of time doing it. But it was (is) a really fun game, that I spent about 150 hours on. I prefer it than harvest moon. Looking forward to this one. I will be buying this when it comes to the US (and will be buying xenoblade if it ever comes here) but... I have way too many RPG games to play at once. Oh Well, a few more can't hurt. I'm gonna pass. I have played way too much Harvest Moon. I can't play this kind of game anymore, it is too tedious. I'm glad that this game is finally coming out. I've been really looking forward to it. I will probably pick it up on the PS3 though. Yes! I'm actually surprised we're getting it so soon. I expected fall 2012 at least! One console before WiiU or a typo? We can trade this for any of the 3 Wii RPGs that we've been asking for?